Warriors in the Crossfire looks at one boy’s experience of impending war – war fought by two nations, Japan and the U.S. – on the Pacific island of Saipan. The island’s families are caught in the crossfire of invasion. In order to survive, Joseph, the main character, must find a new understanding of being a warrior. This novel provides a historical perspective on American involvement in the Pacific front during WWII, an aspect of American history seldom represented in children’s literature. Warriors addresses important themes regarding survival of heart and spirit when family and culture are under attack. The novel is created through narrative but also includes verse and kanji, Japanese elements of writing. "Nancy Bo Flood reveals for us a world rarely spotlighted – the “other side” of the story of the World War II battle for Saipan. She tells a riveting tale, never skirting tough issues of mixed loyalties, if and when to ignore authority, and family ties that bind or don’t. This is history that is gripping, enlightening and engaging." 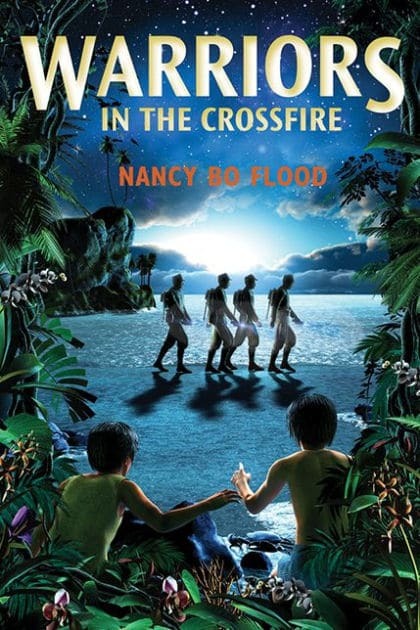 "...Nancy Bo Flood's Warriors in the Crossfire – the cover does not express what is going on inside that magnificent little book." "I read all of Warriors in the Crossfire and the best part was when the family was safe in the caves. Some parts were scary." Liam's grandmother, the late Nancy Weil, who fought long and hard against cancer, was the first person to read the rough first pages of Warriors and encourage me to keep writing. "This story needs to be told," she nodded. Fifteen years later her grandson is reading those same pages. "Having researched and written four books about World War II in the Pacific, I tend to be a bit harsh on any fictional attempt to recreate what happened during those terrible times. However, I have to say that I like this book, simply because it was so real. The characters in this book reminded me of people I knew during my years in the islands; people who lived before and during the fighting, and who had rebuilt their islands and their lives afterwords. The events that Nancy Flood creates in her novel could have happened. I would go so far as to say they did happen even if the names are fictional. Hollywood should make a movie out this." -Bruce M. Petty, author of Saipan: Oral Histories of the Pacific War.